The Day of Atonement foreshadows two significant events: Jesus’ sacrificial death, and Israel’s repentance at the Messiah’s return. “They will look at Me whom they pierced” and repent, the Lord declares in Zech. 12:10. God will deal with the nation’s sins and remember them no more (Isa. 43:25; Jer. 31:34). Isaiah prophesied that the nation would be born spiritually in a day (Isa. 66:8; Rom. 11:26-27). This will be the prophetic fulfillment of the Day of Atonement as Israel comes face to face with its Messiah at the end of Daniel’s “70th week” (Dan. 9:24-27), a seven-year tribulation period that begins with the rise of an evil world ruler known in Jewish theology as Armilus and in Christian theology as Antichrist. Throughout the tribulation, many Jews will turn to Christ in the midst of great persecution, acknowledge Him as Lord and receive Him as Savior. At the same time, God will pour out His wrath on a wicked and Godless world. At the end, perhaps on the very Day of Atonement, the Jews will receive their Messiah as He comes in power and great glory as King of kings and Lord of lords. The high priest does all of the work – offering 15 blood sacrifices, lighting the candles, etc. Jesus, our “great high priest” (Heb. 4:14), did all the work of redemption so that salvation is by grace alone through faith (Eph. 2:8-9). The high priest humbles himself, wearing simple white linen clothing. Jesus humbled Himself by becoming a man (Phil. 2:5-8). The high priest must be spotless, having his sin atoned for before he may enter the presence of God behind the veil. Jesus was sinless (2 Cor. 5:21). The high priest enters the Holy of Holies only once a year, taking the atoning blood of bulls and goats behind the veil into the presence of God. Jesus offered His own blood once and for all, and the veil of the Temple – symbolizing the separation between holy God and sinful man as well as representing the body of Christ – was torn in two (Matt. 27:51). The blood the high priest takes into the Holy of Holies can only cover sin. Jesus’ death at Calvary took away sin (Heb. 7:27; 9:12, 25-28; 10:4; John 1:29). In addition to the high priest, the goats also foreshadow the work of Messiah. Both goats have to be spotless, as Jesus was sinless. 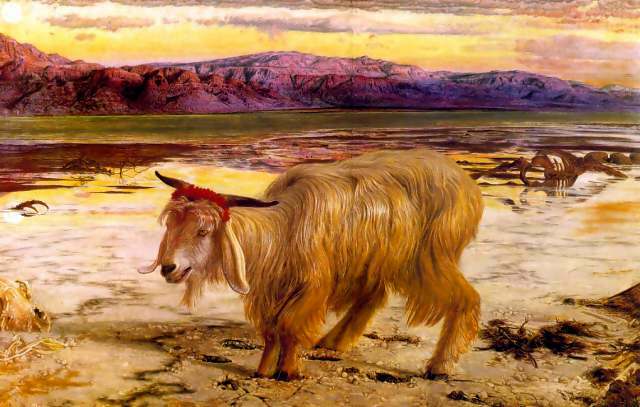 The goat “for YHWH,” whose blood is shed, symbolizes the substitutionary death of the Messiah. The goat “for azazel” symbolizes the finished work of Jesus in taking away our sins, never to be remembered again. Just as the high priest takes the blood of the goat “for YHWH” into the Holy of Holies to make atonement for the people, Jesus entered the heavenly Holy of Holies with His own blood as the once and final payment for our sins. Finally, in Lev. 25:8-17, God gives instructions for the Year of Jubilee (every 50th year). He tells the Jews to sound the trumpet on the 10th day of the seventh month, which is the Day of Atonement. Why not the first day of the seventh month – or, for that matter, the first day of the first month to mark the beginning of this special year? The reason becomes clear when we see the results of the Day of Atonement. In the Year of Jubilee, land reverts to its original owner, slaves are set free, all debts are cancelled, and the land rests. What a marvelous picture of the results of Christ’s sacrificial death. Jesus cancelled our sin debt, redeemed us out of the slave market of sin and set us free, promised us a place in heaven, and gave us rest. The sorrowful self-denial of Atonement is turned to joy as Jesus, the Lamb of God, invites us to enter His rest. This is the sixth in a series of articles on Jesus in the feasts of Israel. Day of Atonement Lev. 23:26-32; Num. 29:7-11 10th day of Tishri (September/October) To make annual atonement for sins. The crucifixion and Israel’s repentance at the return of Christ. Yom Kippur, or the Day of Atonement, is Israel’s most solemn holy day. Kippur is derived from the Hebrew word kaphar, which means “to cover.” On Yom Kippur, atonement is made for the previous year’s sins by the priests and people through the sacrifice of spotless and innocent animals. The event takes place in the fall, on the 10th day after the Feast of Trumpets (Rosh Hashanah) and completes the “Days of Awe,” the 10-day period of self-examination and reconciliation from Trumpets to Atonement. God designated Yom Kippur as a day in which “you must practice self-denial” (Lev. 23:27, 32). It is a day of fasting and repenting of sins for the previous year. It is such a vital day that God said the person who refuses to devote himself to fasting and repentance “must be cut off from his people” (Lev. 23:29). In addition, all forms of work are prohibited. Those who ignore this command are to be put to death (Lev. 23:30). Yom Kippur is an especially significant day for Israel’s priesthood. On this day only, the high priest enters the Holy of Holies and stands in the presence of God’s glory. Many animal sacrifices are offered on this day. Besides the daily burnt offerings with their required grain and drink offerings, additional offerings are made, including a bull, a ram and seven lambs for the people, and a ram for the priesthood (Num. 29:7-11). The high priest normally does not perform the Temple sacrifices, but during the week leading up to Yom Kippur, he serves beside the priests, and on the Day of Atonement performs all of the services alone. He stays the entire week before Yom Kippur in the Temple area, and is sprinkled twice with the ashes of a heifer to make sure he has not somehow become unclean by touching a dead body (Num. 19:1-13). The morning service. Even though the Jewish day begins at sunset, the Temple service for Yom Kippur does not take place until dawn the next morning. The high priest, who normally washes his hands and feet before serving in the Temple, on this day totally submerges himself in a special bath behind a large linen curtain where only the shadow of his movements may be seen. He then dresses in his high priestly garments: a purple robe hemmed with small golden bells, and the golden breastplate studded with 12 precious stones as a reminder that he represents the 12 tribes of Israel. Then, the high priest washes his hands and feet and conducts the morning service. He returns later, washes his hands and feet again, bathes again, and dresses in his white linen clothing for Yom Kippur. In all, the high priest bathes and changes clothing five times, and offers 15 blood sacrifices, on Yom Kippur. The high priest returns to the bull a second time, placing his hands on the animal’s head and confessing the sins of the priesthood. He then slaughters the bull and collects its blood in a golden bowl. An attending priest stirs the blood so it will not congeal. Next, the high priest takes live coals from the altar and two handfuls of incense and makes his way through the thick veil that separates the Holy Place from the Holy of Holies. Inside, he pours the incense onto the coals and waits for a fragrant cloud of smoke to fill the room so that he will not see God face to face and die. In Solomon’s Temple, the Ark of the Covenant was in the Holy of Holies and the Shekinah glory of God rested above it. After the Babylonian captivity, the Ark was never recovered. The Holy of Holies was an empty room except for a single stone, called the foundation stone, projecting about two inches above the floor. The high priest leaves the Holy of Holies momentarily, returning with the golden bowl of bull’s blood. He sprinkles the blood in front of the altar – once upwards and seven times downward. Then he again leaves the Holy of Holies and places the golden bowl on a golden stand. He sacrifices the goat “for YHWH,” collects the blood in another golden bowl and enters the Holy of Holies for a third time, sprinkling the goat’s blood the same way he has sprinkled the bull’s blood – always counting aloud to prevent errors. After, he sprinkles the outside of the veil with the bull’s blood, then the goat’s blood, and finally he mixes the bull’s blood and the goat’s blood and sprinkles the horns of the altar in the courtyard. Now the attention focuses on the remaining goat – the one “for azazel.” The high priest places his hands on the goat’s head and confesses the sins of the people. The “scapegoat” is then led by a priest 10-12 miles into the wilderness and released, never to be seen again. Some Bible commentators say that in the days of the second Temple, the priest would lead the goat to the edge of a rocky ledge and push him off so that he plunged to his death; if this is so, it is more than God required, for He commanded that the goat be released. In any case, the goat, symbolically carrying the sins of the people, could not be allowed to return. While this is happening, the high priest finishes sacrificing the bull and the goat on the altar. Then he addresses the people, reading the Yom Kippur passages from Leviticus and Numbers. Last, the high priest offers burnt offerings on the altar. One last time, the high priest enters the Holy of Holies to remove the fire pan and incense ladle. He bathes and changes into his golden garments just as the cool autumn night approaches. Yom Kippur today bears little resemblance to the biblical observance, primarily because after the Temple was destroyed in 70 A.D. there was no longer a prescribed place to offer the sacrifices. A leading rabbi in Jerusalem at that time, Rabban Yohanan ben Zakkai, led the nation to abandon atonement through blood sacrifice in favor of mitzvot, or good works. As a result, human traditions have replaced biblical practices in the observance of this feast. Synagogue services are the focus of Yom Kippur today. These services draw huge crowds, much like Easter services in Christian churches. The synagogue is decorated in white and adorned with white flowers to symbolize cleansing from sin, and worshipers even wear white as a reminder of the white linen the priests wore on this High Holy Day. In very orthodox circles, the tradition of Kaparot is observed. It involves the killing of an innocent animal, normally a chicken, to atone for sin. In Lev. 25:8-17, God gives instructions for the Year of Jubilee (every 50th year). He tells the Jews to sound the trumpet on the 10th day of the seventh month, which is the Day of Atonement. Why not the first day of the seventh month – or, for that matter, the first day of the first month to mark the beginning of this special year? The reason becomes clear when we see the results of the Day of Atonement. In the Year of Jubilee, land reverts to its original owner, slaves are set free, all debts are cancelled, and the land rests. What a marvelous picture of the results of Christ’s sacrificial death. Jesus cancelled our sin debt, redeemed us out of the slave market of sin and set us free, promised us a place in heaven, and gave us rest. The sorrowful self-denial of Atonement is turned to joy as Jesus, the Lamb of God, invites us to enter His rest.